U.S. 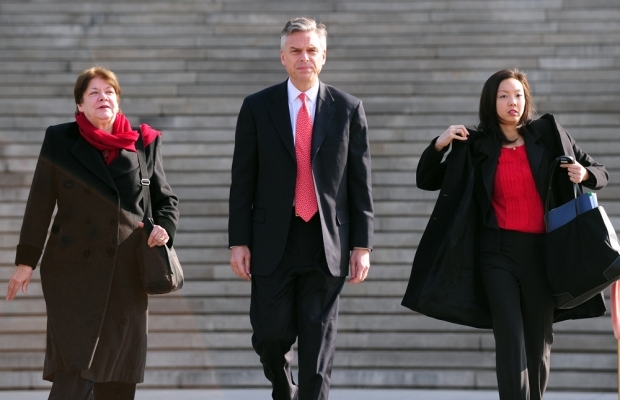 Ambassador Jon Huntsman, center, and embassy personnel leave the Supreme People’s Court in Beijing on February 18, 2011. Ambassador Huntsman was there to call for the ‘immediate’ release of Chinese-born American geologist Xue Feng after a Chinese court rejected an appeal against his conviction and an eight-year sentence on a state secrets charge. In the last week, power and pageantry have engulfed Beijing as China has convened its Twin Congresses: the annual meeting of the country’s two highest decision-making councils. As the Communist Party has seized the opportunity to celebrate its grip on power and lay out China’s economic and political roadmap for the next five years, other changes have nearly slipped by, such as President Obama’s announcement of a surprise replacement for outgoing Ambassador Jon Huntsman. Join us on Sinica this week as we look behind the curtains of power and explore what these developments really mean. Joining Kaiser Kuo in the studio this week is Jeremy Goldkorn, the man behind the indispensable danwei.org. We’re also delighted to have Public Radio International’s Mary Kay Magistad in our studio along with Jeremiah Jenne, Qing historian and Dean of China Studies at the IES program in Beijing. Rounding out our group is Josh Chin, China correspondent for the Wall Street Journal, who makes his debut appearance on Sinica this week.